"However, Ukraine should get used to the fact that people are appointed to a high office not to promote their drivers [reference to now-detained former Interior Minister Yury Lutsenko who had allegedly promoted his driver to an officer’s rank]. Power is given to serve the people.."
Ironic that shortly after her own appointment to the position of deputy head of Yanukovych's presidential administration last Spring, Herman's son, Mykola Korovitsyn, [now Herman] was appointed Deputy Minister of Emergency Situations. His experience prior to this? As an aide to parliamentary deputy Taras Chornovil, and..being his mum's driver...[More here] ..... what a nice boy..
Would not someone with a lifetime's experience in the emergency services or, perhaps from a military background be more suited for this loft deputy minister's job ? Selective application of law..normal for Ukraine..
Arrests of some organisers have recently been made after large protests and demonstrations by small and medium-sized businessmen in Kyiv's Independence Square earlier this month. One, or more of the organisers have been charged with criminal damage to the square's granite paving - 200,000 hryven's worth of damage was allegedly caused by protester's hammering tent pegs into gaps between paving stones. But, as this excellent well illustrated U.P.blog reveals, in 2007, when Party of Regions, who were then in opposition, staged mass protests on the same spot, official Kyiv city authority's records show in total, 3,000,000 hryvnyas of extra costs were incurred by the city, including repair of damage, as a direct result of the demonstrations. Will any arrests of PoR's 2007 demonstration organizers take place now Mrs Herman? According to a statement by the head of the Prosecutor-General's press service today, former minister of Internal Affairs, Yuriy Lutsenko, is being detained because: "until today he has avoided fulfilling our demands of the necessity to familiarise himself with the evidence [of the case against him]. He was warned him that if he continues to draw out this familiarisation, his conditions of bail would be changed. Therefore he was detained yesterday." To me it all rather sounds like something from an Aleksandr Solzhenitsyn novel. Who is to decide whether he is familiar with the details of the case against him or not - and to what degree of familiarity? How, apart from Lutsenko himself, can anyone be sure? Lutsenko said in court today that he has been reading 150 pages a day [of a reported 25 volumes of evidence], but has had to write many summaries and notes by hand for his own use because permission to make photocopies of this evidence was denied. But he did not complain that he is being denied time to prepare his defence though, so where's the problem? Why is he in jail? He may as well be charged "for being a nuisance..a general nuisance in the house.."
Lutsenko has now been formally arrested and is to be detained for 2 months. His lawyers will be lodging an appeal for his release. All this over an alleged unlawful $5,000 payment made tp the former minister's driver. The time and labour of dozens of security men, prosecutors, investigators, judges, and drivers, etc. etc. involved in this case must have cost many times more than this sum already. But that's not the point is it? Last September it was reported in "Kommersant" that according to the the Ukrainian State Committee for Regulatory Policy and Entrepreneurship, the Kremenchuk company "Livela" had long ago obtained the right to import petroleum products into Ukraine without payment of VAT, excise and import duty. In August alone, it was estimated by experts that the company imported 18.3 thousand tons of light oil valued about $ 14.6 million. During that month about 300 thousand tons of petroleum products in total were imported into Ukraine. The loss to the country due to "Lavela's" concession, in that one month, was more than $ 4 million. This has been going on for years....and guess what..one of the owners of "Livela" is a PoR deputy, Volodymyr Zubyk. The press office of first vice-premier Andrei Klyuev refused to comment on the "Livela" affair, but a source in the Ministry of Fuel and Energy told "Kommersant" that those "at the highest level" are engaged in its activities. But hey, its all legal, so who cares....How many more "Livela's" are there? e.g. official Mercedes Benz distributors in Ukraine, who are the only one's capable of servicing their most expensive models, estimate that up to half of these models are imported illegally. Why should the IMF provide any financial assistance to a country with such a poor record of tax and import duty collection? On 17th December the VR passed a law introducing fines for tenants who fail to pay their housing/communal services bills on time. From 1st January a 0.1% fine per day of arrears will be applied to unpaid bills. There are rumours the law was passed at the request of the IMF as a condition for its loans to Ukraine. But one of the major problems faced by tenants is late payment of salaries which, in some cases they fail to receive for many months. E.g. there have been very few trams and buses running in Ukraine's second city Kharkiv for several days now, wages have not been paid since the summer, and such cases are legion. A large portion of the country's housing stock is in a poor state of repair. Utility provision is often erratic, and water quality poor. Tenants requests for improvements are often ignored. Drastic increases to gas and electricity tariffs are imminent in the New Year. Pensionable age is to be incrementally increased from its current low level, but bearing in mind Ukraine's very short life-expectancy rates, it will mean many of it's citizens will never live to seetheir retirement. The current reform programme will be most painful for the country's citizens - a quarter of more of whom live on the fringes of poverty. But for the population to accept this tough fiscal medicine, there has to be some kind of national concensus, as has been seen e.g. in the Republic of Ireland and elsewhere. At the same time elected and non elected goverment officials have never had it better - there can expect budget increases all round. E.g. spending on sanatoria and leisure facilities for parliamentary deputies is being increased by about 50% - about 1000 times more is spent per parliamentary deputy on these facilities that for the healthcare for individual members of the public, even though many, perhaps most deputies judging by their clothes, watches, automobiles etc. are very wealthy indeed. The average health bill for each parliamentary deputy paid for by the state is over 5000 times greater than for 'joe public' Next year, over 77% more is to be spent on the State Prosecutor's office. Many other government institutions e.g. the Presidential Administration, are also receiving boosts to their budget. The president is buying helicopters, building helipads for millions of dollars, building palaces for himself for tens and maybe hundreds of millions of dollars, yet the national debt is still increasing and default can by no means be discounted. Foreign newspapers are disturbed how a friend of the president's son, Serhiy Arbuzov, came to be appointed head the National Bank of Ukraine recently with no discussion or questioning in parliament. His declared income for 2009 alone was over 150 million hryvnya [about $ 19 million]. None one knows where this came from. Yanukovych's son is to buy half the shares of the Ukrainian Development Bank, for 110 million hryvnya. How did such young men amass such wealth? Are their tax affairs available for scrutiny? Hardly. According to the influential Polish 'Rzeczpospolita' newspaper, permission for young Yanukovych to buy the bank is to be confirmed his pal the new head of the NBU. One of the country's best-known politicians, Former Minister of Internal Affairs, Yuriy Lutsenko was taken into custody today, quite bizarrely in connection with the poisoning in 2004 of Viktor Yushchenko. Former president Yushchenko's party, 'Nasha Ukraina' have immediately issued a statement declaring the motives for the detention to be "entirely political." "By throwing a public person behind bars without providing any understandable reason, the authorities are demonstrating only one thing - that they are clearing opposition forces and politicians from the political scene have embarked on a course of police [state?] monopoly," they add. In recent days about 12 or 13 of PM Tymoshenko's former ministers and close aids have been arrested or are constantly being questioned and harrassed by prosecutors. A possible explanation for this hounding of opposition leaders by the ruling Ukrainian authorities was provided in the Russian "Nezavisimaya Gazeta" recently. A Party of Regions representative told them off-the-record, that the president does not preclude holding parliamentary elections next year, while in public he talks of holding them in Autumn 2012. PoR really would like a 300+ constututional majority in parliament - at present they are 20 or 30 seats short and the Communists cannot be relied upon absolutely to support certain policies. The current actions are intended to further weaken the opposition, enabling a swift and decisive parliamentary election campaign to be held some time next year, before painful reforms start to bite. But there is a risk of creating martyrs - PoR will be painfully aware that Tymoshenko's brief incarceration almost 10 years ago was the start of a path that led to the PM's office, so this plan could backfire. Fractious opposition leaders will be forced into ever-closer co-operation in the interests of self-preservation. Nevertheless, it looks as if the persistent harassment will continue - the opposition just has to take it on the chin, for now. Several days ago 'Dzerkalo Tyzhnya' questioned the head of the economic section at the Japanese embassy in Kyiv about the recent criminal charges made against former PM Tymoshenko and her alleged misspending of hundreds of millions of euros received from the sale of carbon emission rights under the Kyoto Protocol. "Can you comment on the situation surrounding accusations against Yulia Tymoshenko of misuse of funds received under the terms of Art. 17 of the Kyoto Protocol?
" We know that a criminal case has been opened against the former prime minister of Ukraine, and the Government of Japan will watch developments closely. We also believe that cooperation in this field (implementation of green investments) is extremely important for both countries. The Japanese side has received confirmation from National Environmental Investment Agency of Ukraine that these funds are protected from misuse.... after the recent media reports, we communicated with Ukrainian government agencies, in particular the NEIA, and received confirmation that the funds intended for environmental projects, are protected in full." It is generally considered that, ahem...by 'gentlemen's agreement', the seller of quotas acquires high technology and ecologically-friendly equipment from the purchaser of the quota, i.e. the money makes its way back to the quota buyer in exchange for goods and services. The Japanese companies that made the payments may be pissed off that confidential agreements have been breached, that they have been dragged into Ukrainian political in-fighting, and may be still be expecting orders to be placed.. If the current Azarov government do not spend this money and honour Ukraine's side of the contracts, it will they who will be held responsible, and the Japanese side will be entitled to redress. According to DzT, it could all cost Ukraine half a billion Euro, minimum, and the chances of selling greenhouse gas emission quotas in the future destroyed. Meanwhile the Ukrainian NEIA, the agency directly responsible "for executing the demands of the UN convention on climate change and introducing mechanisms envisaged by the Kyoto protocol..and realising projects for protecting the environment..." posted a statement on their site on 23rd December. The risible case against Tymoshenko looks ever more like crude political repression. Yanukovych is planning to visit Japan early next year. He may have some explaining to do. As mentioned in my previous blog, Arbuzov astonishingly did not utter one word of thanks and did not address parliament detailing his plans for the future when his appointment was ratified on Thursday. The thought that he is a civil servant responsible for looking after the financial assets of all of the country's citizens, and that he is directly accountable to these citizens, does not seem to have entered into his pea brain. Upstart Arbuzov, when appointed deputy head of the NBU this summer, allegedly insisted that other deputy heads submitted applications in writing, detailing reasons, if they wanted to bother him about any matter. Arbuzov's attitude is par for the course for members of Yanukovych's clan. The president has hardly ever exposed himself to open-microphone questioning either.. He was clearly 'underwhelmed' by this, declining to say any words at all to those present - no words of thanks, nothing about his views on the current economic situation, nothing of his past...nothing. Deputy PM Boris Kolesnikov "promised reporters that they would soon have a chance to talk with newly appointed governor and hear from him what he is planning to do to strengthen the independence of the central bank and the country's banking system" - needs a grown-up to hold his hand? p.s. Arseniy Yatsenyuk, who was deputy head of the NBU for a couple of years and acting head for half a year, claims that "by appointing one of their own, it means one thing - they [the Yanuk clan] have privatised the NBU." Yanuk clan's banker given keys to NBU? PresidentYanukovych has nominated one of his son's best pals, the little-known Serhiy Arbuzov, for head of the National Bank of Ukraine. His appointment will almost certainly be approved by parliament. Arbuzov [see photo] - known as "Banker to the Yanukovych clan", clearly wasn't chosen for his good looks alone. Since being appointed NBU deputy head in September, he has not made himself popular. He has a reputation for boorish manners , ignoring and 'blanking out' fellow NBU staff, and for walking inside the bank and through the bank's hallowed corridors surrounded by his own personal bodyguards. The reaction of the banking world has been, shall we say, at best, "mixed". Trolley buses and trams have not run in Kharkiv, Ukraine's second city, for the last three days - about 700 drivers and conductors are on strike, demanding immediate settlement of wage arrears. Their trade union committee claims that the total amount owed to employees is 22.4 million hryvnia. Wages have not be paid since July/August 2010. So former PM Yulia Tymoshenko has been charged with 'misspending state funds' - 'a crime that could put her in prison for a decade'. According to Unian, which publishes a photocopy of the official charge sheet: "acting knowingly, out of personal interests,[she] individually decided to take the decision to use part of the funds received from the sale of quotas for emissions of greenhouse gases which were to be used a specific purpose [for projects to reduce greenhouse gases only..FN], to cover expenses of the State Budget of Ukraine, particularly pension payment obligations." U.P. publishes copies of documents indicating that just over one month ago, the full 320 million euros of Kyoto protocol money was to be found in a special 'ring-fenced' UkrExImBank account, complete and intact. So where's the 'personal interest'? It seems some of the Kyoto money, when it was received, was put into the StateTreasury 'Pensions' cookie jar instead of a cookie jar labelled 'ecology projects'. According to paragraph 4 /2 of Ukrainian Cabinet of Ministers' procedures, the StateTreasury is permitted to move money from one jar to another, "on a returnable basis." So where's the problem? There must surely be better cases with which to 'nail' Tymoshenko. If Ukrainian pensioners were provided with two options: receive no pensions fo a couple of months but put the Kyoto money into a jar with a green label; or receive pensions and put the Kyoto money in the green label jar at a later date, what would they advise? Tymoshenko is accused of 'losing' the 0.05% commission for converting the Kyoto euros into hryvnya, i.e. about 1 million hryvnya. But this was done through the state-owned National Bank of Ukraine, so there was no loss incurred by Ukraine itself. p.s. This all reminds me of an old neigbour of mine who used to take two five pound notes to the post office every other week and deposit them in his account. On the intermediate weeks he would go to the post office and ask if he could take out the money he had deposited the previous week. On receiving the money he would carefully examine the bank note serial numbers and say, "This is not the same money I gave you last week....I demand you give me the money I gave you last week..."
The second Tymoshenko coalition government was formed on a 50-50 basis by BYuT and NUNS, yet it is only Tymoshenko, and her cabinet and other associates who are being harassed by prosecutors. Yushchenko's boys all seem to be in the clear...President's union at work? Payback for not supporting Tymoshenko in last February's presidential elections second round? Disturbing events have occurred in recent days at the prestigious Donetsk National University, increasing tension around an affair that has been rumbling on for several months now. In July this year, the rector, Volodymyr Shevchenko who had been in the position for over 24 years, was sacked by Ministry of Education Dmytro Tabachnyk. Two candidates stood for election to the vacated post: Tabachnyk's man - Petro Yegorov, who had temporarily been appointed as acting rector, and head of the economic cybernetics department at the university - Yuriy Lysenko. On 10th December, a conference of the 'trudoviy kolektyv' unexpectedly supported Lysenko for the job. His nomination as rector needs now to be approved by the minister of education. Lysenko who had complained that the campaign had been unfair, nevertheless won in a vote by a solid majority. He also had a personal motive to stand for election, his wife, Tatiana Lev, university vice-rector and dean of the financial and economic issues, had been dismissed from the university by the new bosses. A few days later, on 15th December, while he was away, Lysenko's apartment was raided by police in connection with possible charges of embezzlement by 'certain university officials'. Local press report that the 17th December election may have been annulled by the Kyiv regional administrative court. But as usual in Ukraine, things are not quite what they seem. There has been a lively debate in the local press discussing possible reasons why the new government was pushing so hard for a new university head. At a meeting with teachers and students, acting rector Yegorov had presented a proposal for the construction of a new 24-storey building in place of the existing Philological Faculty building. Yegorov said that he could find funds for the construction of the tower block, but the university community was indignant because the current department buildings, where human rights activist and poet Vasyl Stus had studied, would have to be demolished. Interest in the project intensified when it became clear it was linked to two other projects in Donetsk involving the MAKO construction company, which belongs to Alexander Yanukovych - the president's older son. Some unofficial commenters claim 13 hectares of land - the 'PhilFac', a swimming pool, and a sports ground near city centre" have been promised to Yanukovych's son" by Yegorov. This is not the first time Yanukovych's boys have been involved in dodgy property deals. Yuriy Lysenko's victory is seen as a reaction by the University to pressure from the Ministry of Education, which had originally sacked in the popular Volodymyr Shevchenko, and then tried to impose its own candidate for rector. Deputy Minister of Education Yevhen Sulima, having come to 'make sure their man won, refused to congratulate the winner or comment on the election results to journalists. One rumour circulating is that the alleged confrontation between Yegorov and Lysenko is a continuation of a long-running conflict between education minister Dmytro Tabachnyk and vice-premier Boris Kolesnikov. And the latest: On the evening on 17 th December, on the way home, Lysenko's wife, Tatiana Lev, was badly beaten up by two assailants, who shouted: "This is for your husband..."
According to WikiLeaks, Dmytro Firtash, in conversation with US ambassador William Taylor two years ago "maintained that the era of the “law of the street” had passed, and businesses could now be run legitimately in Ukraine." Just a reminder here of the 'filthy lies' the British "Guardian' newspaper has been spreading about this philantropic gas trader..
Head of the presidential administration, Serhiy Lyovochkin, when questioned about reforms in a press briefing on Tuesday, said president Yanukovych: "is aware that he is taking unpopular steps...he understands that this will affect his ratings. But he has the political will and responsibility before his electorate..If everything goes to plan, in 2015 Yanukovych will not have any political opponents." Meanwhile... yet another of former PM Yulia Tymoshenko's ministers has been detained. This time it's former minister of the environment, Heorhiy Filipchuk. Criminal charges may be imminently brought against Tymoshenko herself and against her closest political aide, Oleksandr Turchynov. Criminal investigations have commenced against another of Tymoshenko's closest assosciates , BYuT deputy Andriy Shkil. And her ex minister of internal affairs, Yuriy Lutsenko has been accused by the Prosecutor General' office of misuse of public office. Criminal charges may result. In the Czech Republic, the former Ukrainian economy minister in Tymoshenko's cabinet, Bohdan Danylyshyn, has been detained and is seeking political asylum. Ukrainian authorites are demanding his extradition for abuse of power. At this rate, maybe Lyovochkin is correct..but just a little reminder to him: "All political lives, unless they are cut off in midstream at a happy juncture, end in failure, because that is the nature of politics.. " Enoch Powell, British politician..
"The Kyiv Post website, effective Dec. 14, 2010, is blocking access to all web traffic originating from the United Kingdom in protest of the draconian libel laws there that hinder legitimate free speech and threaten the work of independent journalists, authors, scientists and others worldwide. In a phenomenon known as “libel tourism,” rich and powerful plaintiffs file lawsuits in London – “the libel capital of the world” – to exploit laws stacked in their favor, stifling journalism and threatening news organizations and others with costly lawsuits. For more information, please log on to: http://libelreform.org/"
The Kyiv Post website can now no longer be accessed by its few dozen British readers...Thank you Rinat Akhmetov..Thank you PoR tossers...Thank you from the heart of my bottom.. Declassified CIA documents on Stephan Bandera, Mykola Lebed, OUN, UPA ,and their relations with the US British intelligence services have been released in the National Archives publication: "Hitler's Shadow." Particularly fascinating is chapter five: pp. 72-97. Last Sunday, PM Mykola Azarov, accompanied by ten bodyguards (!) attended a concert by the world-class opera singer Anna Netrebko and the National Symphony Orchestra of Ukraine. When his entry into the concert hall was announced, many of the well-heeled public repeatedly called out "Shame! ", and booed in their hundreds. And at the end of the concert, as it was announced that the huge bouquet of flowers being presented on stage by two bodyguards to the star of the show were from Azarov, the audience vented their feelings and booed and heckled again. This was no student rabble or football crowd, but well-to-do people who came to listen to classical opera - one of the cultural highlights of the year. Ukraine "boycotting the Nobel Prize"
By their friends shall ye know them...What a disgrace! The latest Wikileaks revelation that "Ukraine will become a mafia state" is, as anyone who follows your humble blogger, straight from the department of the "bleeding obvious". As just one example, yesterday in a fine piece of investigative journalism, Konstantyn Usov of 'Lyeviy Bereg' reveals how Serhiy Demishkan, [son of a prominent PoR parliamentary deputy and boss of the massive"UkrAvtoDor" state road construction company, Volodymyr Demishkan], in late 2007 with two other collaborators, allegedly kidnapped and brutally murdered a business associate, Vasyl Kryvozub. They had had a running dispute over the unreturned deposit of $46k for rental of an aircraft the poor victim had owned. They tied him up, forcibly poured vodka down his throat - breaking several bones in the process, strapped a central heating radiator to his back and dumped him into a canal where he drowned. Demishkan's final words to his victim were, allegedly, "Say hello to Jacques Cousteau.."
Usov publishes lots of leaked evidence and video'ed interviews to support his allegations. Kryvozub had managed to secretly send an SMS message while he was being kidnapped, and the three suspects were caught soon after the terrible crime was perpetrated. They confessed in full and even showed law enforcement officers over which bridge they dumped the still living Kryvozub. Last September, Demishkan was released from detention by judge Iryna Hryhoryeva of the Kyiv Appeals court after he had claimed his confession was made under duress. The judge has now been promoted the highest court of criminal justice in Ukraine....headed by Leonid Fesenko, a former PoR parliamentary deputy. There are only poor people in Ukrainian prisons..
More and more is appearing about a shadowy long-time colleague of president Yanukovych, PoR deputy Yuriy Ivanyushchenko [a.k.a. Yura Yenakiyivskiy, after their common home town]. Yura Y., who oversees many of the Yanukovych family's financial flows, is gaining an ever-greater grip of portions of Ukraine's economy, particularly in the agriculture sector. An emminent western diplomat claimed that grain export quotas are being selectively granted to companies whose owners are close to the current administration, and our hero Yura. 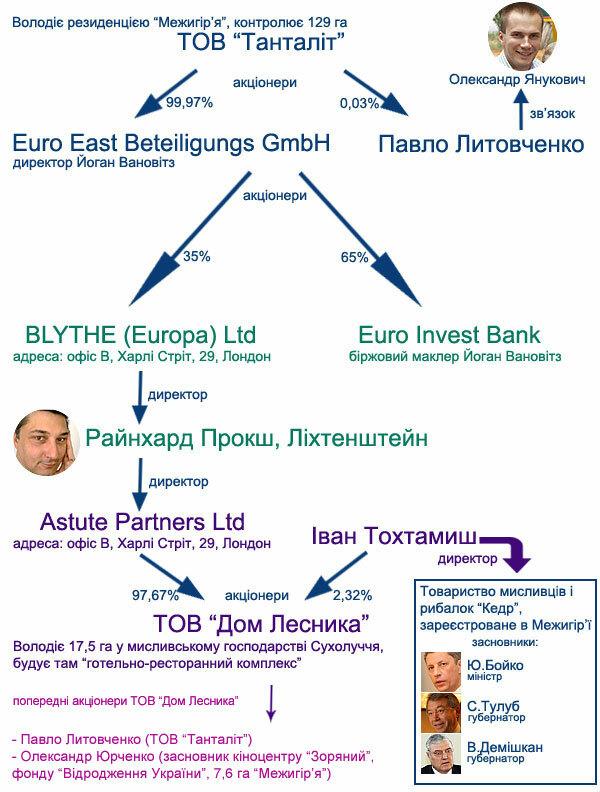 Yura Y. has also benefited big-time from the state 'recapitalisation' of the all-but-bankrupt Rodovid Bank. Semyon Mogilevich, one of FBI's most wanted people, identified as real power behind billionaire owner of Ukrainian-based RUE"
"..The Day of Remembrance for Victims of Holodomor and political repressions in Ukraine is marked the fourth Saturday of each November. On January 21st, 2010 a ruling of the Court of Appeal in Kyiv came into force prescribing blame for the organization in 1932-1933 Famine-Genocide in Ukraine on the Bolshevik leaders of the USSR and the USSR. A corresponding decision was made by the Court on 13th January 2010. The Court decision confirmed the findings of investigators of the Security Service of Ukraine on the organization of and commission, in 1932-1933 on the territory of the Ukrainian SSR, of the leadership of the Bolshevik totalitarian regime [the general secretary of the CPSU (Central Committee of the Communist Party of the Soviet Union) Joseph Stalin, member of the CPSU, chairman of the Council of People's Commissars of the USSR Vyacheslav Molotov, secretaries of the CPSU, Lazar Kaganovich, and Paul Postyshev, member of the CPSU, General Secretary of the Communist Party in Ukraine, Stanislav Kosior, member of the CPSU, chairman of the Council of People's Commissars of Ukrainian Soviet Socialist Republic, Vlas Chubar, Second Secretary of the Central Committee of the Communist Party of Ukraine, Mendel Khatayevich] in the "genocide of the Ukrainian national group (gruppa), i.e. artificially creating conditions calculated to bring about its partial physical destruction." The court determined that Stalin, Molotov, Kaganovich, Postyshev, Kosior, Chubar and Khatayevich committed the crime of genocide, according to article 442 Part 1 of the Criminal Code (genocide), and closed the criminal case in connection with their deaths. As a result, the genocide in Ukraine of three million 941 thousand people was perpetrated (according to the findings of a pre-trial forensic demographic investigation by the State Academy of Science Institute of Demography and Social Studies im. Ptukhi) . Criminal charges of genocide in Ukraine in 1932-1933, were initiated in May 2009, by the SBU under Part 1 of Art. 442 of the Penal Code." Quite clear then, where the editors of 'Donbass' (and a good portion of its readership? ), who can hardly be considered 'anti-Russian', stand on this issue. So why are the Russians so upset by the "g-word"? Some current events TV programmes deliberately introduce lengthy aggressive debates on the Holodomor and kick awkward topics for the government, such as current demonstrations by small-scale entrepreneurs against the passing of a new tax laws, into the long grass. p.s. Watch and listen to truly moving eye-witness accounts of the Holodomor, with English sub-titles, in Anna Gin's film, 'Zhernova' [The stone mill] here. Rich get richer..you know about the poor..
10,5% of Ukrainian families do not have enough money, even for food. 41,2% have enough money for food, but have find it difficult to buy clothes or shoes. Almost all Ukrainians, 96,7%, are worried, in varying degrees, about rising prices. 46% of those questioned believe that the culprits responsible for the current skyrocketing prices are both the current and the previous administrations in equal measure. The proportion of citizens who believe that price inflation is the more the fault of the current government than the previous government is 21.9%. 16.2% think that the previous government is more to blame. In contrast, president Yanukovych, not content with building himself a clubhouse at Mezhyhirya, which could cost an eye-watering $200M, and acquiring a private Monaco - in Crimea , 'Segodnya' also reports a 'grandiosnyi remont' has been taking place at the ugly 'Synyohora' state dacha in the Carpathian mountains for over a month, so that the president may spend his Christmas and New Year vacation there. Video here of how just a few dozen PoR regions parliamentary deputies voted through the controversial new tax code today. The records will show 269 deputies voted in favour of the motion. Voting for absent colleagues is unconstitutional, but small matters like that don't seem to matter in the Ukrainian parliament. The small-scale entrepreneurs that will be hardest hit by the new tax laws look determined to continue their actions. The callous manner in which these laws were enacted by the authorities will stiffen their resolve. This same bunch of PoR tossers also bulldozed through procedures enabling changes to be made to the Ukrainian Constitution in parliament without the need for signed personal voting slips to be placed in ballot boxes during voting so it will not be necessary for deputies to attend parliament in person to make changes to the country's Constitution. The president signed off these new parliamentary procedures just a few hours later. They have no shame...no respect to the electorate...Can any serious international body take the Ukrainian parliament or its president seriously from now on? President Yanukovych considers yesterday's protests by small-scale traders and entrepreneurs against the introduction of a new tax code, were prompted by "their unwillingness to pay taxes "
How ironic that the daughter of Deputy Prime Minister Serhiy Tihipko who headed the working committee drafting the tax code , as well as other prominent officials, was involved in a $3,000,000 tax scam involving prestige automobiles just a few months ago. As someone once told me: "Ukrainian prisons are for poor people only .."
Big demo's were staged in Kyiv today by market traders and other small business owners protesting against proposed new tax codes. 'Segodnya' estimated between 30,000 and 50,000 took part in noisy but peaceful protests. Similar scenes were seen in Khmelnytskyi, were maybe 10,000 protested in the main square [see photos here] Smaller demo's took place in other cities too. These small-scale entrepreneurs form an important segment of the economy, providing employment for millions, particularly where other jobs are not available.They are now organising the biggest demo's seen since 2004. These guys know that right now, the proposals in parliament are just that - proposals...Once the laws are passed there's no way back, hence today's big push.. The Azarov cabinet have ignored 'straws in the wind'. 'Nezavisimaya Gazeta' claims most analysts agree that the country is on the brink of default. The external debt of Ukraine at the end of the year will make up 41% of GDP: the load on the state budget on debt service is growing steadily and will reach its peak in 2013. The government is being tightly squeezed by its main creditor, the IMF, so, as in other countries, they are being forced to comply with the fund's demands and take very unpopular decisions, otherwise it will be impossible to keep within planned budget parameters. 'N.G' concludes: "But the attempt to pass these problems onto the shoulders of the most socially active [and resourceful?] ordinary citizens who were able to build up their own business in recent years could turn into a revolution, in which new political leaders could appear, experts admit." While on a visit to Kalush in Western Ukraine today, at a meeting with administrative representatives of the Ivano-Frankivsk oblast', Viktor Yanukovych said that representatives of the opposition who were elected heads of local government in the local elections on October 31, should not be in opposition either "to any government or to its nation." "Democracy - is not self-mockery. It is a kind of constructive approach to life. If you have a competitive programme - go ahead, realise it, we can create the conditions." "But when it is considered, for example, in one region, that five heads of cities of one party were elected - and the party is in opposition, that these five heads will be in opposition? I myself can not imagine this ... I will twist off his head if he does not deal with the sewage or with water, and gas [problems], " added Yanukovych clumsily. He doesn't get it. These five city mayors were democratically elected by voters in their cities just a few days ago...if they do not deliver on their promises they will be kicked out at the next elections...If Yanukovych doesn't deliver on his promises does he imagine someone will "rip his head off"? Last night, president Yanukovych's wife Lyudmila attended a cultural East-West Ukraine cultural project at the Donetsk National Opera and Ballet Theatre. She was presented with an ornamentally inlaid cassette box by the Ivano-Frankivsk oblast governor, who expressed a wish that: "it would be filled with Viktor Fedorovych's awards." LEvko expected the box be the size of a dumpster on castors, but no, in the photos it looks quite small. Problem is, what do you give the Yanukovychs as a present? 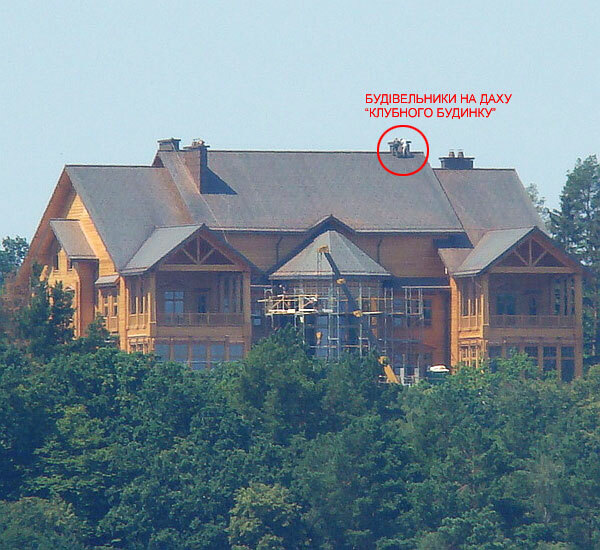 His 'club house' in Mezhyhirya, about which he bragged in Berlin earlier in the year, is nearing completion. At the peak of construction, 500 workers per day were passing through the site. The garage alone holds 70 vehicles. Just two internal doors cost $158,000, and one door, made of Lebanese cedar cost $64,000. $81,000 was spent on a ballustrade for the winter garden. The estimated total cost of the internal trim and fittings exceeds $10,000,000; and the cost of the entire project could be a staggering $200,000,000. And if that was not enough, Yanukovych is "Building himself a private Kingdom of Monaco - in Crimea", complete with a 900 metre length of private beach along one of the most desirable parts of the coastline. Where will the little cassette box go? What did it have carved on it? "Ukraine for the people" -Yanukovych's election campaign slogan, perhaps? Dirty man for a dirty job? President Yanukovych today proposed his old pal from the 'bad old days in Donetsk', Viktor Pshonka, for the position of Prosecutor-General of Ukraine. Parliament will certainly 'rubber stamp' and approve his appointment Thursday. The big-selling 'Segodnya' newspaper, carries a piece entitled: "Pshonka could probably throw Tymoshenko behind bars, says source". 'The source' considers Pshonka's main task will be to provide a "final solution to the problem Tymoshenko" by "bringing the investigation of abuses in the government of Yulia Tymoshenko to their logical conclusion", and that he will not waver in this matter. The current 'vlasti' are apparently annoyed that their recent politically inspired, high media profile audit/witch-hunt of Tymoshenko’s government was not as successful as hoped, and did not produce the results they had expected in last Sunday's regional elections. The [city's] 'Obyektiv' Media Group stated that information on the last three and a half hours [counting?] has been destroyed. Commission members say that until data is restored, there will be no news on the voting results in Kharkiv [Ukraine's second largest city]. Data on the results of ballot counting has not been updated since 14.00 hours. Meanwhile, the chairman of Kharkiv Oblast State Administration Mykhailo Dobkin has already declared that his [ahem..ahem..] mate and close business partner, Hennadiy Kernes, is victor of the mayoral elections, without waiting for the count to be concluded. Head ofthe regional headquarters of the "Batkivshchyna" opposition party, Yuriy Prav, said: "I'm surprised that even though a certain party and its people in the city's electoral committee made no small effort to falsify the Kharkiv mayoral election results, this did not help, and they had to" burn the bridges behind them." p.s. Check out mayoral opposition candidate Arsen Avakov's blog for photos of the chaos, damaged sacks containing torn voting slips, and video illustrating the 'don't give a damn' attitude of guards and counters in Kharkiv. Ukraine stops for 43 days? Hanna Herman, Deputy Head of the Pres's Administration, was asked recently about her boss's motorcade which regularly passes through central Kyiv at maniacal speeds. The roadblocks which enable its passage cause great disruption [and occasional death] to other road users. Herman's nonchalant response was: "When President Yanukovych stops, the country stops". Even though the country is the depths of a severe economic crisis President Yanik has packed his bucket and spade and is currently on a 43 day [!] summer holiday - after only four months at the job. Luckily the saps at the IMF will be lending Ukraine almost $15Bn soon, so why not spend a bit of it on a nice long holiday with the missus? Yesterday's big-selling 'Segodnya' runs an 'end of term' report on Yanukovych's first few months of presidency as all the 'politicos' go off on their holidays. On the plus side it states that the worst fears about the state of the economy have not materialised. By the autumn it is reasonable to expect improvements in business conditions and an upturn in the economy. The IMF loan, and major Euro-2012 projects will aid GDP growth. Ukraine's geopolitical position has improved with good relationships being established with the U.S., E.U., and with Russia. In September Yanukovych is travelling to Beijing and his visit could bring new benefits because his hosts are seeking new footholds in Europe. But the 'Segodnya' piece states that the Yanukovych has not been entirely successful in maintaining stability. There have been rumblings of discontent within PoR's ranks e.g. surrounding the sacking of emergency situations' minister Nestor Shufrich, and disagreements with PoR's coalition partners, but the situation is managable. Yanukovych cannot be fully sure of support from coalition partners in his attempt to expand his presidential powers. Deputy PM in charge of economic issues, Serhiy Tihipko, a potential major rival, is a problem too but if he were to leave, or be kicked out of the cabinet, both he and PoR would suffer, so such an event is unlikely right now. There has been no progress in the battle against corruption - the author writes: "..economic breakthrough, with the current level of corruption, will not be achieved." In LEvko's opinion, there are two contentious matters mentioned. The author of the 'Segodnya' piece claims Yanukovych has not delivered on his election promises to upgrade the status of the Russian language in the country, and that: "if the election promises of Viktor Yanukovich on the Russian language continue to be ignored, it may even have severe consequences for Party of Regions in the next election." Hmm..
p.s. Several days ago Ukrainian TV channels broadcast a disgustingly brown-nosing 40 minute portrait of the new president on the occasion of his 60th birthday. Watch out for the dazzle - the sun now officially shines out of his a***.